Polish preacher of the sixteenth and seventeenth centuries. The name so written is given by Sternberg ("Gesch. der Juden in Polen," p. 183), apparently taken from Polish sources, and ascribed to a famous preacher of Lublin. Basnage ("Histoire des Juifs," ix. 993, The Hague, 1716), however, calls him Judah Vega, saying he must not be confounded with the Spanish rabbi of Amsterdam (see Vega, Judah); and he refers to him as having published a collection of sermons toward the end of the sixteenth century during the reign of Sigismund. Wolf ("Bibl. Hebr." i., No. 709), though using the Hebrew form , agrees with Basnage, adding that the work was entitled "Derashot." 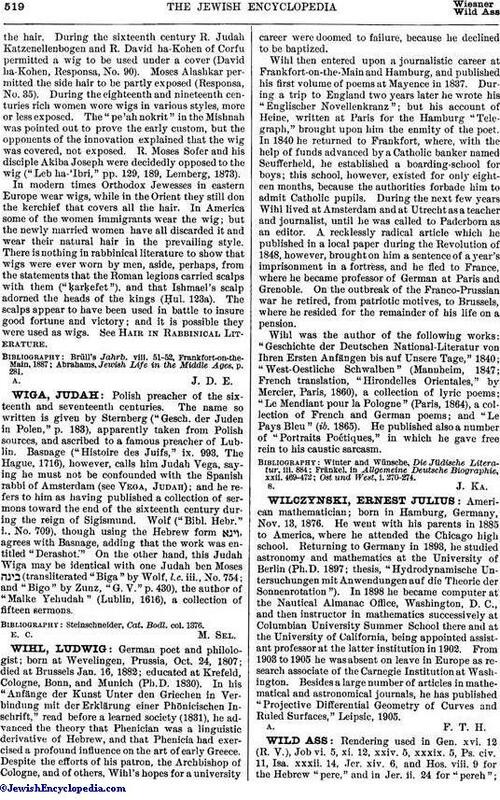 On the other hand, this Judah Wiga may be identical with one Judah ben Moses (transliterated "Biga" by Wolf, l.c. iii., No. 754; and "Bigo" by Zunz, "G. V." p. 430), the author of "Malke Yehudah" (Lublin, 1616), a collection of fifteen sermons. Steinschneider, Cat. Bodl. col. 1376.